Old School Rat Rod Racers Photo Picture Classic Cars for sale & Classifieds - Buy Sell Classic Car & Classic Truck Classifieds. This picture was sent to us from a member who found it while scanning his grandfathers old negative slides. He believes it is from the late 40's maybe earlier. As you can see from the photo it is an old dirt racetrack and the community came out to watch. Appears to be a Ford Roadster in the front along with a 40 Ford to the right (No. 9). No. 6 and No. 5 have yet to be identified but take note of the "Golf Bag Door" on the side of the No. 6 car! Judging by the sans dreadlocks,mullets,cornrolls and long hair look, I'd say it was around the late forties or early to mid fifties. Can you imagine if that really was a Auburn boattail....?...what a waste. 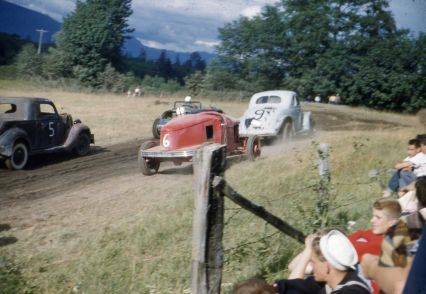 I'd say fifties..looks like some very cool rides here..too bad so many of the old cars got wrecked like this..but back then who knew what they'd be worth today. No safety barricades at this track, ah the good ol days!